Bananagrams is a daily routine for the Troubadour and me, usually after breakfast. If you like Scrabble, you’ll like Bananagrams even better, or at least you will if you prefer creating good words to thrashing your opponents! Some of my friends (she knows who she is!) find the whole competitiveness thing utterly alluring. Getting a two-letter word onto a triple words score is all that matters even if you have no idea what that word means … not me, my friends, I’m rubbish at Scrabble. But cast your eye on this picture – such fun! Not enough Cs in the pack though – I wanted to add avocado, garlic, coriander and Mexican (we allow ourselves one proper name each per game! So adaptable). C’est la vie. I got round ‘rocket’ by going francaise. Pretentious? Moi? Will try and remember to take some photos of the finished dishes and post them on here. It’s dinner for twelve hungry potters so let’s hope it doesn’t disappoint. Before you promise chocolate pistachio fudge (an old Nigella recipe, very easy and good), check you have a shop where you can buy ready-shelled nuts. I didn’t. I searched around and eventually had to buy pistachios in shells. My recipe called for 150g nuts and each of my packs had 200g (I bought two as I had no idea how much weight would be lost in the shelling). But now I do. Let me tell you, dear friends, that 200g of pistachios in shells amounts to 103g shelled nuts, a vast pile of debris for your compost heap, and two shredded thumbs. I have half a pack left but can’t face them. The troubadour can have them with his beer as a reward for going out, uncomplaining, to the shed to fetch the ladder for my aerial view photographs! Friends who don’t live here probably get sick of me saying what a great place Newburgh is to live. However – look at this picture – it’s only celebrity chef Tony Singh, making burgers at a WI meeting in our own church garden! And assisted by Rosie, our soon-to-be Cub leader and herself a chef lecturer. Tony had been invited by the Rural, and set up an unassuming stall with his lamb burgers, veggie kebabs, seared salmon and loads of lovely salads. I thought I might be hallucinating but no it was definitely him. Who else sports a turban and kilt with such panache? We had a great conversation about Sikh hospitality, food poverty, and personal identity. What a warm, friendly, down-to-earth guy. I liked him so much that I bought his book and he signed it for me – ‘To Helen: Keep it tasty’ or words to that effect. I reckon I’m going to work my way through his recipes, a bit like Julie and Julia. Well not quite – Julie cooked a new recipe from Julia’s book every single day for over a year, and I couldn’t keep up the pace. But I feel a change of style would be good for me – I’ve been so at home for so long with Hugh Fearnley-Whittingstall, especially the vegetarian recipes, that I’ve maybe grown a bit complacent. So now it’s time to spice it up! As soon as ‘The Hidden Gardens of Newburgh’ is done and dusted, I’ll be getting close and personal with the aubergines, the coriander and the ‘Holy Trinity’ (his words) of ginger, garlic and chilli. 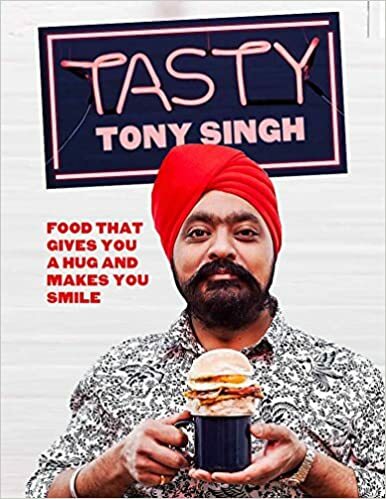 Tony Singh’s view of food poverty is that all the government policies are too unconnected, and the people who write the policies don’t have enough personal experience of going hungry. And unfortunately he doesn’t have the answer – no nice wee projects that I could hitch a ride on. So I think I’m going to do some kind of ‘Feed the World Buffet’ – in the generous-hearted, lively and tasty Sikh way – and I’ll be looking for people to join in the fun! Maybe end of August? Watch this space!